Chicago Public Schools officials say at least 65 schools will have to make drastic cuts without pension help from legislators. Officials with the nation's third-largest district ratcheted up warnings on Monday, saying at least five schools in each of the 13 CPS regional networks will have to slash around $200,000 each from their budgets. Schools with increasing enrollment will largely see increased budgets, and those with declining enrollment will see lower budgets, according to CPS. This means neighborhood schools will receive a $60 million cut, while charter schools will see a $40 million increase. "No one would argue that these are the budgets that we would like to be presenting, but they reflect the reality of where we are today; a budget deficit of more than $1 billion; the demands of a broken pension system; and a state education funding that is near last in the country," Interim CPS CEO Jesse Ruiz said in a statement. Mayor Rahm Emanuel blamed the budget impasse in Springfield for the harsh cuts, calling them "unacceptable" and "unconscionable." The bugdet cuts will likely lead to hundreds of teacher layoffs, according to Jesse Sharkey, vice president of the Chicago Teachers Union. The dire projections come as the district has already made budget cuts in the wake of ballooning pension payments. 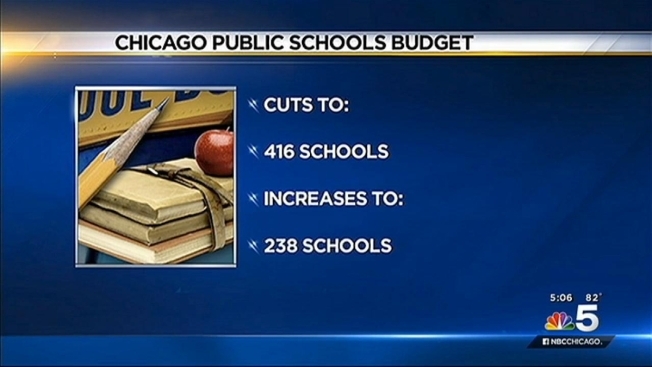 CPS faces more than a $1 billion budget deficit. The district had asked legislators for an extension on a June 30 pension payment, but lawmakers rejected it. That left the district to borrow and cut $200 million, including eliminating roughly 1,400 positions. Chicago Mayor Rahm Emanuel says lawmakers could help by changing how the district has to fund its teacher pension system. "No other district has to choose between making pension payments or funding educational programs," Ruiz said. "Chicago's children should not be treated as second-class citizens in Illinois. They deserve the same education that students in Winnetka, Hinsdale and Aurora receive."